In 1882 Denmark issued a new series of definitive stamps featuring 2 numerals centered by the coat of arms. This issue exists in a number of varieties and values. The first issue in 1882 of 5o Green and 20o Blue are the high catalog value stamps ($70 to $100 each). 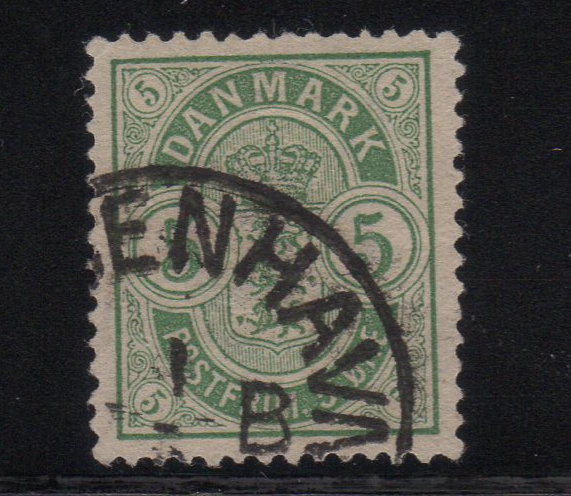 These stamps are distinguished from the later stamps with smaller corner numerals and differences in shading around the crown as well as spacing between the bottom oval and the frame. The differences are very hard to distinguish, but there is a thread on StampCommunity that details the differences well so I won’t go into them here. You will also find slight shade differences in most of the values. Aside from the Small Numeral Issue, all of these stamps have catalog values less than $10 and are fairly easy to obtain.